What’s Franklin’s big news? Not only is he starting to try and put weight on his back legs, he’s able to wag his tail again! 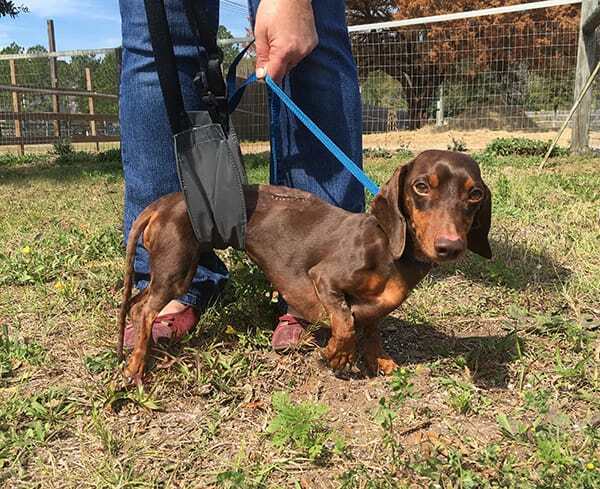 This is excellent news for our sweet little doxie’s recovery! A big week for a little dachshund! 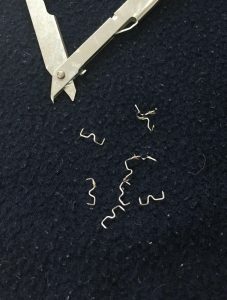 Today Dr. Timberlake helped Franklin get ready by removing his surgery staples. 9 staples and lots of doctor-prescribed snuggles later, Franklin’s ready to share some big news. Keep an eye out Wednesday for his next update! 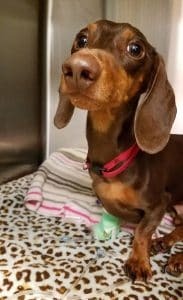 Franklin is a bright, affectionate, 3 year old dachshund that lost the use of his back legs due to a condition known as thoracolumbar intervertebral disk disease (IVDD). 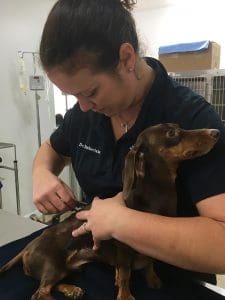 Franklin needed surgery to survive, but his owners were unable to afford the cost and opted to surrender him to a good samaritan’s care instead. 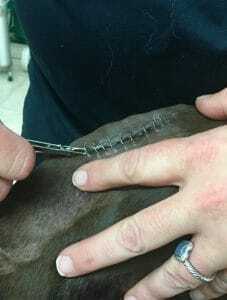 Thanks to our partnership with the American Veterinary Medical Foundation and Southeast Veterinary Hospital’s very own AVMF Veterinary Care Charitable Fund, Dr. Timberlake was able to coordinate with a specialist to get Franklin’s surgery. And now, just over a week later, he’s finally on the road to recovery! 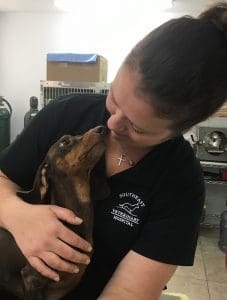 Keep your eyes on this space for updates on Franklin as he heals, goes through physical therapy, learns to use his legs again, and finds his forever home! We are Frankie, Stevie, and Honey. 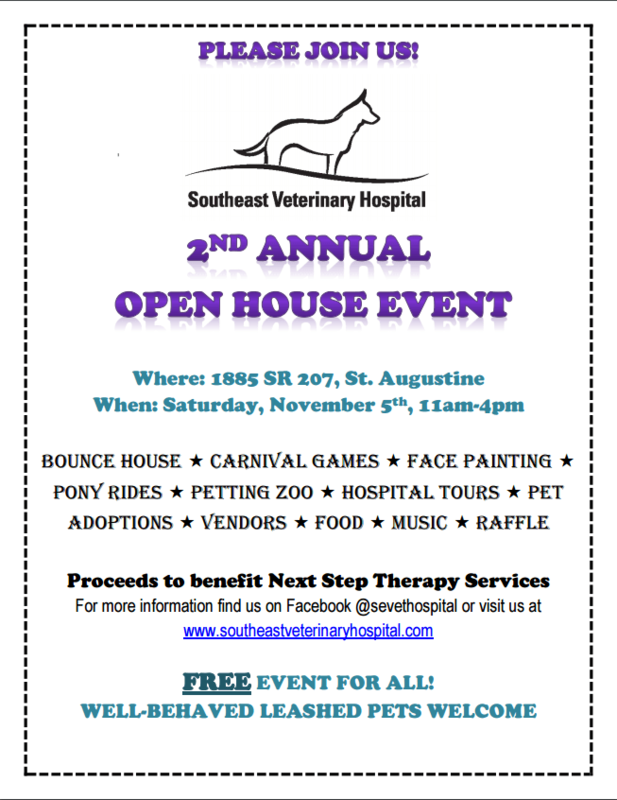 Our parents own and run Southeast Veterinary Hospital in St. Augustine, FL. We get to see what a great job our people do everyday. We also get to see the sick pets that we take care of at the hospital and we hear our people talking about how some of this stuff could have been prevented….if only their people knew. So, we thought why not let them know!!! Frankie: I am a 2.5 year old German Shepherd Dog. My full name Is Francine – but all of my friends call me Frankie. I LOVE chasing my Frisbee and going on morning runs with my mom and dad – Britany and Chad Timberlake. They own Southeast Veterinary Hospital. I have 2 other small people at home that I help take care of – Charlotte and Nora. The more I can kiss them and get them to play with me the better my life! 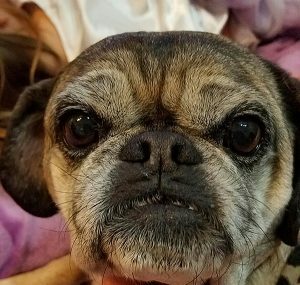 Stevie: I am an almost 9 year old Pug / Beagle mix (mostly pug). I am affectionately called “The Puggle” by my people. I am named after Stevie Knicks because I love to howl and make a “vroom, vroom” sound when I get really excited. I live with Frankie and the rest of my family. I love sleeping – anywhere, all the time. I love getting petted – all the time, by anything (like feet) or by anyone. Even if I am sleeping. That is really all that I do…. 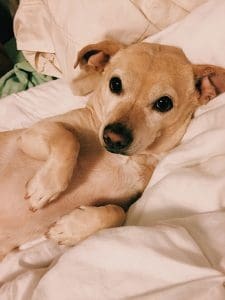 Honey: I am an 11-year-old mixed breed. My mom, Chelsea Gross is the Director of Hospital Relations at the SEVH. She likes to make people guess what type of mix I am, everyone says something different! I love snuggling, sleeping under the covers, and walking in the park every day. Getting muddy in the creek is the BEST, even if I have to get a bath afterwards. Mom takes me everywhere but my favorite places are the beach and grandma & grandpas house (treats!). You may or may not be aware that on February 2nd a news story was run on WSBTV in Atlanta regarding several pet owners that feel that their dogs were adversely affected by Bravecto. As always, we want you to feel safe and comfortable with the products that you give your pets. If you have any questions or concerns, please do not hesitate to reach out to us @ 904-823-1270. Saturday hours starting February 4th, 2017! We are excited to announce that beginning February 4th, we will be open from 9:00am – 12:00pm on Saturdays! If Saturday appointments are best for you, please request an appointment today for your pet! Join us at our hospital for our FREE 2nd Annual Open House on Saturday November 5th from 11:00am – 4:00pm! We will be offering carnival activities of all kinds, as well as hospital tours and a raffle. All proceeds benefit Next Step Therapy Services. 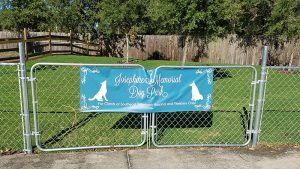 Introducing the Josephine Memorial Dog Park! 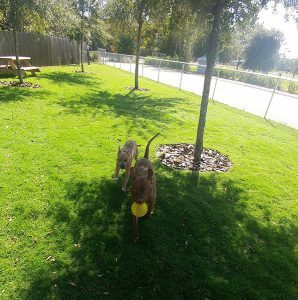 Come check out our brand new, beautiful 5,000 sq ft dog park! It’s FREE for all of our clients (that’s you)! 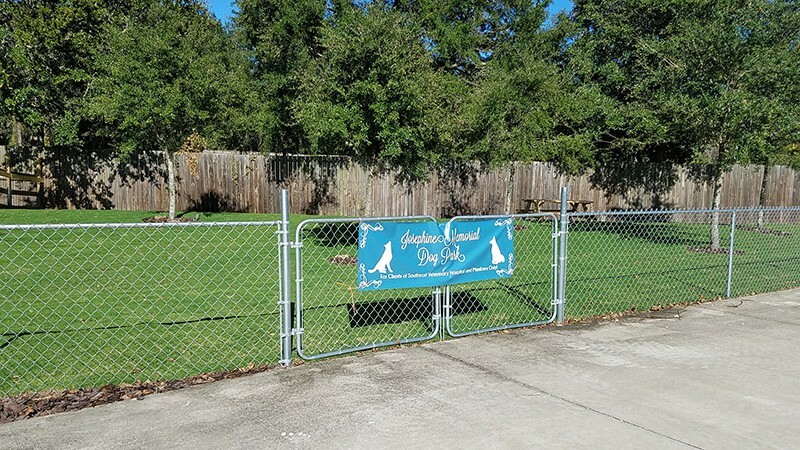 Throw your dog a puppy birthday party, or have the park all to yourself! Reservations available! Call us at 904-823-1270 for more information. 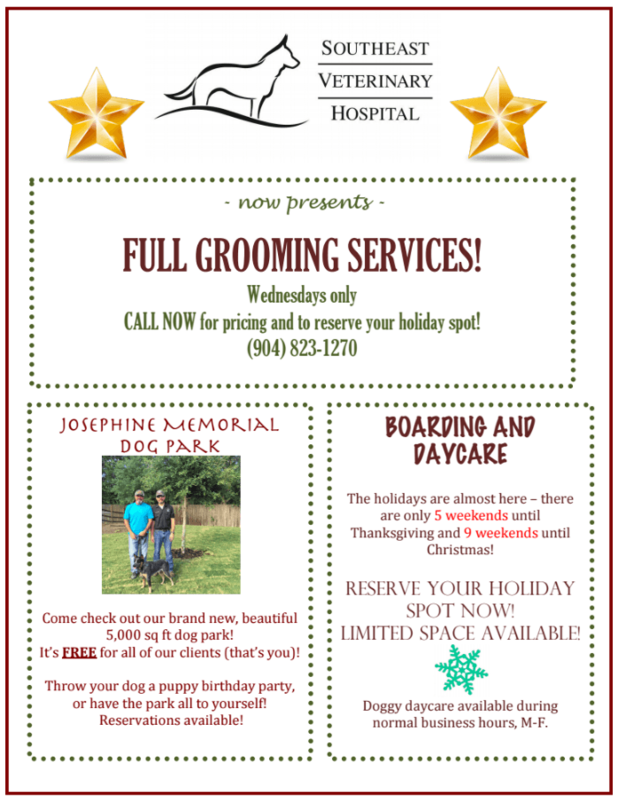 Boarding, Grooming and Dog Day Care services! 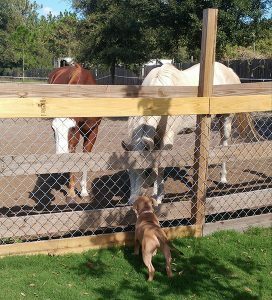 Southeast Veterinary Hospital is proud to offer boarding, grooming and day care services to our clients! Full grooming services are available on Wednesdays only, and day care services are available during normal business hours, Monday through Friday. The holidays are coming fast, and spots are filling up – be sure to book space for your pet now! While we are often reminded to have our families prepared in the event of an emergency, many people forget that includes pets, too! In the event of a power outage or evacuation, make sure to have a disaster kit prepared. Current vaccine history, a current photo and a crate or carrier. 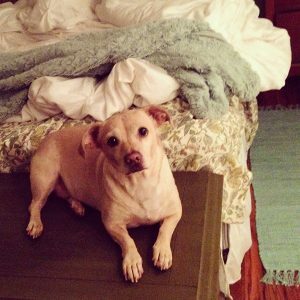 Be sure to check that your hotel accommodations and/or shelter are pet friendly in case evacuation is required. Visit https://secure.aspca.org/form/free-pet-safety-pack to order a FREE safety pack that includes a rescue window decal to alert emergency personnel that there is a pet in your home!